This posting features a small project we completed recently for a homeowner in Northern Virginia. This custom cased opening features fluted square columns and an arched header. These archways can be made to fit practically any existing drywalled opening. The fluted columns wrap around the drywall opening. These can be custom made to fit any thickness wall, any height & width opening. In this blog we show a few pictures of a small railing and stair tread replacement project we completed awhile back. The homeowner had another contractor in to finish the basement, and you can see the final outcome of the stairway they were left with. It's really hard to believe that someone would actually finish a basement and leave anything even close to this type of workmanship behind. This stairway renovation includes custom newel posts made to match the balusters. These were custom fabricated by Mike Hart owner of, IKCO Construction, Inc. in Franconia, VA. Scope of work: demo existing iron railings, repairing stairway framing, cutting back existing marble flooring in foyer for new oak landers, supplying custom made solid 5/4" oak stair treads oak brackets and oak risers. Also we had Mike Hart, custom make the radius oak lander & risers for the landing. We also installed oak flooring at the landing and an over the post oak rail system. This railing included full volutes, over the post up easings and "s" fittings. The oak railing is 6010 design, the oak balusters are 5040 design, newel posts custom designed to match balusters. Then we had the whole system and flooring professionally sanded, stained and finished in a golden oak color. There is still a little painting to be done around the inside and outside stair stringers and ogee mouldings. Please call or email us anytime if you would like us to replace your old creaky stairs and outdated railings. We will come by, discuss your projects, make sugesstions, and provide a free price quote. Fill out our CONTACT FORM for your free quote on a new stairway, new stair treads, new railings, or any moulding, cabinetry or remodeling you may need. 1. View of Dining Room mouldings: 4 piece crown moldings, 2 piece chair railing, shadowbox moldings under chair rail, 1 piece 6 1/2" baseboards, adams window & door casings. Please call us anytime if you need any finish carpentry, built-in cabinetry, crown mouldings, or for any of your home improvement projects. We service the entire Northern Virginia area, and several surrounding counties. Fill out our CONTACT FORM for your free quote on a new mantel, built-in or moulding installation! In this entry we feature a small kitchen remodel / renovation we completed this spring. This project included new cabinetry, granite counters, hardwood flooring, recessed and under-cabinet lighting, and a slightly revised layout featuring a raised counter space. The cabinets are "Waypoint" brand, supplied by Taylor Made Kitchens out of Stafford, VA. They feature real plywood vernier cabinet boxes, 5/8" solid hardwood dovetailed drawers with full access ball bearing glides, roll-out trays in all base cabinets, square raised panel doors with six-way adjustable concealed hinges. Please CONTACT US if you would like us to provide a quote on your new kitchen or bath. Here we see a close up view of the paneled beadboard 1/2 wall with corbels supporting the raised granite countertop. Wall cabinet ends with raised panels. All existing 12" bulkheads were removed, 36" tall cabinets were installed along with a nice 3 piece crown molding build-up. Also note the light rail molding along the underside of each wall cabinet for the under cabinet lighting. This homeowner chose to go with a very nice undermount copper two bowl sink, and matching bronze fixtures. Please call or email us anytime if you would like us to come to your home and give you a free, no pressure, no obligation consultation, for your next home improvement project. From a simple bathroom makeover up to a full fledged kitchen or bathroom renovation, let us help you design and build the space of your dreams. Some other home improvement / finish carpentry projects include: Crown Moldings, Chair Rail mouldings, Wainscoting, Coffered Ceilings, Beamed Ceilings, Baseboard moldings, Stair railings, Stairway re-treads, renovations of old outdated railinsg & stairways, Built-In bookcases, cabinetry, entertainment centers, office spaces, mantels / mantles... and much more! Small foyer stairway that we remodeled from a boxed stair tread design to an open tread design. One side note: Please notice that the stair treads are actual treads... not hardwood flooring! Whoever you choose to have your stairway renovated with, make sure they use the proper methods and materials. I have seen far too many stairways just covered over with harwood flooring, which in the end looks like you have a stairway covered over with hardwood flooring! When we are finished with our stairway improvements and retreads, they look just like new stairs. You should not be able to tell they were ever re-done. We ONLY use real solid 5/4" thick oak treads, and real solid oak risers not plywood verniers (or hardwood flooring). If you would like us to quote you a price on renovating your stairway or railings in your home, please don't hesitate to CONTACT US anytime. We will be glad to come out, take measurements, discuss your ideas, offer some of our own, and hopefully work together to improve the quality and value of your home. Here we feature a few pictures of a recent stairway and stair railing remodeling project. This Vienna, Virginia homeowner chose to go with wrought iron balusters with oak railings and newel posts. The scope of work included, removing the old railings, replacing the loose broken stair treads with new solid oak 5/4 thick treads. Adding a full bullnose starting step with a volute fitting on the new rails along with new paint grade risers and brackets. Also installing oak newel posts and (over-the-post) style railing system with black wrought iron balusters. Refinishing the existing oak hardwood floors in the hallway and landing areas. Staining, finishing and painting the new railings and stairway topped off the project. Not very good pictures, but as you can see the railings were practically falling down and had been improperly installed to say the least. Newly refinished oak harwood floors to match the new oak railings. These railings were installed on the lower level boxed in type stairs. Notice the left hand railing with the "S" fitting going to the wall handrail, allowing a continuous rail design. One side note: Please notice that the stair treads are actual treads... not hardwood flooring! Whoever you choose to have your stairway renovated with, make sure they use the proper methods and materials. I have seen far too many stairways just covered over with harwood flooring, which in the end looks like you have a stairway covered over with hardwood flooring! When we are finished with our stairway improvements and retreads, they look just like new stairs. You should not be able to tell they were ever re-done. We ONLY use real solid 5/4" thick oak treads, and real solid oak risers not plywood verniers (or hardwood flooring). 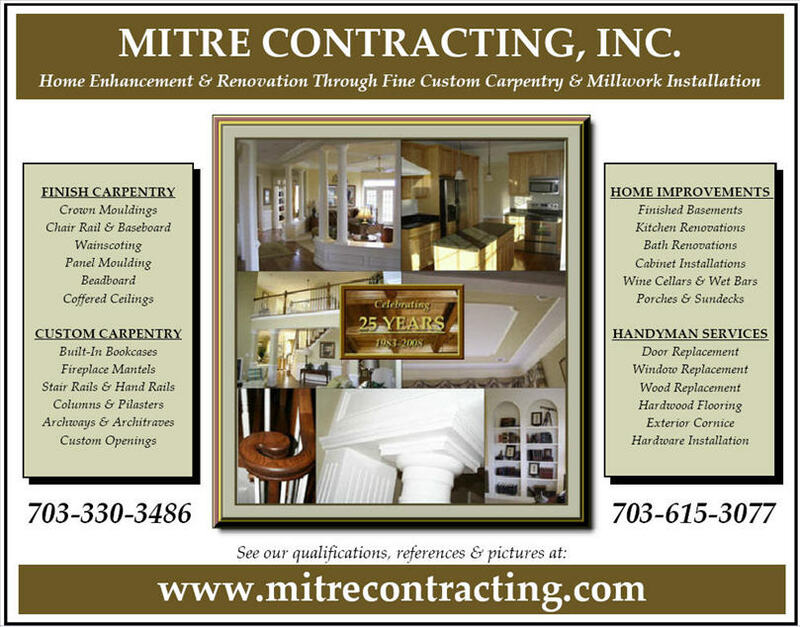 Even though we install miles and miles of mouldings for our customers... we also specialize in many other areas of finish carpentry in Northern Virginia and the surrounding counties. We do more than just mouldings. In this blog we would like to feature a few pictures of some custom built-in cabinetry. This built-in consisted of two units on either side of the fireplace with a mantel feature connecting the cabinetry. Also we built a 1/2 wall bookcase topped off with some 8" tapered columns. This picture shows the final product. Each unit is around 7' wide by 10' tall. Arched valances, plain stiles, open adjustable shelves on the upper units with closed storage below. If you would like us to quote you a price on building some built-ins for your home, please don't hesitate to contact us anytime. We will be glad to come out, take measurements, discuss your ideas, and design a built-in according to your wishes / needs. Let us show you that we do more than just mouldings! This blog posting features a curved staircase remodel project we just completed in Ashburn, VA. The original curved staircase had carpeted treads and risers that were made from standard builder grade pine and plywood materials. The scope of work included removing the existing carpet, removing the old treads and risers and replacing them with custom made solid oak stair treads and solid oak risers and decorative brackets. The new oak treads, risers and brackets were then hand sanded, stained and finished to match the existing hardwood flooring. The handrails were not replaced as the original railing were in great shape and looked fine. The bannister was disassembled as needed and rebuilt. Note also that the balusters were reinstalled by bolting each one into the new oak treads. Previously they had only been sitting in a drilled out hole and nailed in with brad nails. When upgrading a carpeted stairway to oak, you need to clarify the scope of work with the contractor you choose. There are a lot of flooring companies that simply cover over the existing treads with hardwood flooring and nosings... leaving you with a set of stairs that looks like someone installed hardwood flooring up the stairs! Another thing to consider, is do you want a hardwood flooring company re-installing your handrails? We install actual custom made solid stair treads... not hardwood flooring. We install solid risers not verniers or hardwood flooring. We have years and years of railing fabrication and installation experience in order to re-install your existing stair railings or brand new updated railings. Quite a few of our customers update the railings at the same time as the stair-treads. Wrought iron balusters seem to be in demand these last few years. Your newly re-treaded stairway should look just exactly like an original stairway... not a renovated one. Just a few pictures showing a small garden shed construction project we completed this last summer, for a homeowner in Fairfax Virginia. We also built a small platform deck as part of the deal. This shed featured typical 2x4 framing for the walls and roof system, 2x8 pressure treated framing for the floor system, PVC board for all the cornice/trim, vinyl siding and windows... all matching the existing home. Small 8x8 PT deck with Trex decking. Fill out our CONTACT FORM for your free quote on your next home renovation project!